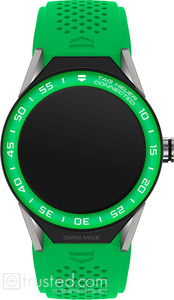 This Tag Heuer Connected Modular 45 Smartwatch features a 45mm titanium case, green aluminum bezel, sapphire crystal glass, digital screen and a green perforated rubber strap. 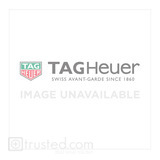 Chemical engraving with Intel inside, TAG Heuer, EAC & CE markings. Laser engraving with 50 meters Waterproof, serial number, article reference markings. Microphone at 3 o'clock, proximity sensor at 6 o'clock visible on caseback. Ring : Green mat aluminum bezel with black “TAG Heuer Connected “lettering and numbers.